In our ninth issue, the Bed and Breakfast Traveller takes you to Muskoka in Central Ontario, just a two hour drive north of Toronto. Birthed by the granite rock of the Canadian Shield, Muskoka offers glittering lakes and green forests, interesting towns and plenty of leisure and shopping choices. 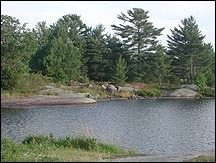 Located around the three major lakes, Lakes Muskoka, Rosseau, and Joseph, with an additional 1600 smaller lakes in which you can choose to paddle your feet or your canoe, Muskoka stretches from Georgian Bay in the East to Algonquin Provincial Park in the west, from the Trent Severn Waterway in the south to north of the Town of Huntsville. Huge white pines intended for ship building first brought settlers to Muskoka, but the natural beauty made it a tourist destination as early as the 1870s. Year-round visual delights and recreational pursuits keep visitors coming back. Gravenhurst, "The Gateway to Muskoka", is located at the southern tip of Lake Muskoka. To see the lakes the way those early tourists did, visitors still flock to Gravenhurst to enjoy a cruise on Lake Muskoka aboard the RMS Segwun, North America’s oldest operating steamship. Her sister ship, the Wenonah II, is currently under construction in Muskoka Bay and is expected to make her maiden voyage this autumn. Sagamo Park is also home to Canada’s largest in-water Antique and Classic Boat Show, starring wooden boats built in Muskoka by Greavette, Duke, Minnett, and Ditchburn. The 100 year-old Gravenhurst Opera House is the home of Summer Theatre in Canada and hosts a variety of productions year-round in its 350-seat theatre. Bethune Memorial House, a Parks Canada National Historic site is the birthplace of Dr. Norman Bethune. It has been restored to the 1890 period, and also has a gallery dedicated to the medical and social contributions of this internationally-known local son. Bracebridge, "The Heart of Muskoka" is a picturesque town set amid 22 waterfalls and is home and studio to many of the artists and artisans of the Muskoka community. Each September the Muskoka Autumn Studio Tour showcases the natural beauty of the fall colours alongside the works of these talented artists. Woodchester Villa is an interesting octagonal house built by a local woolen merchant Henry Bird. It has been restored and is open for tours. Next door is the Chapel Gallery, a local arts and crafts showcase. In July, Annie Williams Park is the site of the Muskoka Arts and Crafts Show, which brings over 200 exhibitors from Muskoka and across Canada. The Lady Muskoka, a 200-passenger cruise boat that tours the Muskoka River and Lake Muskoka from June through October, docks just outside of the downtown area. Ideally located on the 45th parallel of latitude, Bracebridge is the summer ho-ho-home of Santa Claus at Santa’s Village. While the rest of Muskoka enjoys the busy summer season, Santa and Mrs. Claus welcome the young and the young-at-heart throughout their off-season. 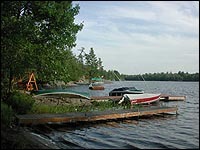 Muskoka Lakes Township encompasses the towns of Bala and Port Carling and numerous smaller lakeside communities where the cottage lifestyle predominates. Bala is the home of the former “Dunn’s Pavilion” where all Muskoka used to dance, and where the KEE concert hall is now located. It is also the Cranberry Capital of Ontario, and hosts a three-day Cranberry Festival the weekend after Canadian Thanksgiving. Periodically the Segwun voyages into Lakes Rosseau and Joseph from the Port Carling dock. The Muskoka Lakes Museum depicting the life of the early settlers and the boat-building heritage of the area is also located here. Huntsville offers scenic beauty and in-town conveniences with its downtown shops and local shopping mall. Lion’s Lookout is located on a hill near the downtown and provides a panoramic view of Huntsville’s Fairy Lake and the surrounding area. Muskoka Heritage Place is the home of the Muskoka Pioneer Village and the Huntsville and Lake of Bays Railway and depicts life as it was in the late 1800s through recreated buildings, gardens, and farm animals. The Portage Flyer, a 1928 steam train, transports riders back in time as they travel along the Muskoka River to Fairy Lake. Just a short drive away is the world famous Algonquin Provincial Park. Local outfitters can provide everything you need for a few days of outdoor adventure. Throughout Muskoka is a network of multi-purpose trails, including the Trans-Canada Trail. Hikers, bikers, skiers, and snowmobilers find their delights in the trails of Muskoka. Once primarily a summer destination, Muskoka offers four seasons of natural beauty, wildlife, and entertainment. Fast becoming a golfing destination, there are numerous public and semi-private courses to delight your eye and challenge your skills.